At the monthly spiritually inclusive services she leads at Pitt Street Uniting Church, Sydney, Dr Stephanie Dowrick brings our attention to what it might mean to think with generosity about ALL the people with whom we share our planet. What would it mean to give up our habits of divisive, exclusionary thinking, and also to grow in discernment and sense of choice about the thoughts and inspirations we welcome into our own minds and hearts? 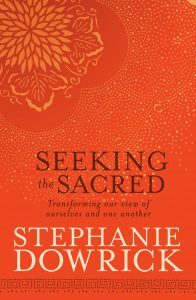 What’s more, she gently challenges us to consider how are we offering compassion to the parts of our own selves that perhaps we have not yet fully owned. This is a deeply encouraging talk, recorded in December 2013, and intended for the Christmas season and way beyond. Please note that all of the recorded video talks from the services that Stephanie leads are available via InterfaithinSydney YouTube link. You are welcome to leave comments on Stephanie Dowrick’s Facebook page.